As I feel, without reservation, that it’s always best to write your own spells, I have never been a fan of spell-books like this. However, Ms. Blake’s book blew me away in its simplicity; in her insistence to change the spell however you need to make it your own so it fits within your own personal system as well as her insistence to also include all mundane acts to your situation. Not only that, but I also like and appreciate how she includes spells for many things one doesn’t usually see pre-written spells for such as anxiety, menopause, graceful aging, faith, closure, jerk avoidance and many, many other real-life issues. Best of all, Ms. Blake also takes time at the beginning of the book to talk about spells, the importance of making it your own, including corresponding mundane activities to ensure the success of the spell, and even working with familiars. All in all, this book surprised me, in a good way. It’s chock full of simple spells that you can do with minimal supplies needed for real life situations that anyone can do no matter their experience level. 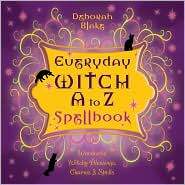 She is light hearted, realistic and quite frankly, this is the only actual spell-book that I would recommend to anyone. Please see our other review of this item, here.